According to a recent report compiled by Transparency Market Research (TMR), the vendor landscape of the global text analytics market is estimated to show remarkable growth owing to the growing demand for IT industry all around the world. Large industries like aerospace and defense industries along with the telecom sector are major contributors of the text analytics market share worldwide. Defense and aerospace industries also implement text analytics in order to study their previous operation patterns as well as to optimize their future operations. Some of the major players of the global text analytics market are Angoss Software Corporation, RapidMiner, Inc., IBM Corporation, Attensity Group, Inc., and Microsoft Corporation. The competitive landscape of the market is fragmented with the presence of many big vendors who are focusing more on creating their brand image the largest in order to stabilize its foothold in the market. New entrants are expected to devise strategic alliances in order to give tough competition to major players and to counterattack them in terms of drawing more revenue shares. As per the TMR report, the global text analytics market is anticipated to earn US$12.16 bn by the end of 2024. The market is expected to expand with a healthy CAGR of 17.6% within the forecast period of 2015 to 2024. As per end-user, the military and defense sector is seen to be exceeding all other end-users by 19.7% revenue share and is expected to continue dominating the market in the future years. Due to the fact that data analysis provides a better understanding of the overall behavior of consumer and their priorities, the growth of the market has seen immense acceleration as more and more companies are entering the market with complete focus on text analytics enhancement. Data in the form of text overflows from multiple sources like the platforms of social media, e-mails, and reviews of consumers on various web portals of the companies. The market is competitively intense with various align strategies along with high priority to consumer preference, thus making the overall demand for market accelerate in the long run. The telecom and IT sectors are predicted to soon overpower the world with rising number if text analytics solutions in order to achieve visible improvement is core operations, internal processes, and market trends. IT sector is to initiate core competencies that enables digitalization and will need effective text analytics solutions to function at a faster speed. With the introduction of IT into the business sector, it is more convenient to store valuable information which further helps to analyze their strategies and produce better results for the consumers. 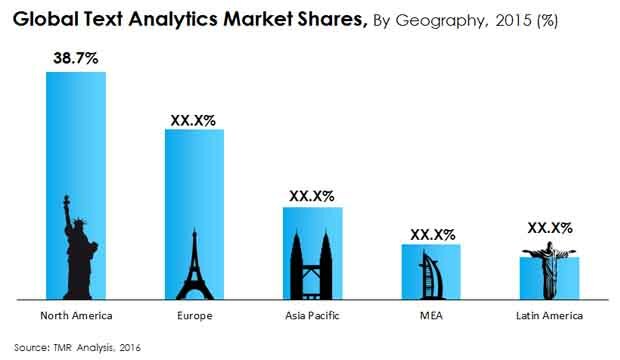 Although the text analytics market is seeing tremendous growth all around the world, factors like high cost and expenditure of on-premise solutions, and license product copies purchase may act as a hindrance to the market. Obtaining licensed copies for products is usually done carelessly and with contempt, thus, posing threat to the market worldwide. However, many vendors are focusing on ways and means to achieve recognition in the market by the utilization of text analytics, and this may drive the global text analytics market in the future years. The information presented in this review is based on a TMR report, titled,” Text Analytics Market ( End-user - Entertainment and Media, IT and Telecom, Healthcare, Retail, BFSI, Manufacturing, and Military and Defense; Applications - Customer Relationship Management (CRM), Intelligence & Law Enforcement, Fraud/Spam Detection, and Data Analysis & Forecasting; Deployment Type - Cloud-Based, and On-Premise) - Global Industry Analysis, Size, Share, Growth, Trends and Forecast 2016 – 2024”.